Washington, DC, November 28, 2018 — The European Commission announced Monday a contribution of €5 million in support of projects spearheaded by Oxi Courage Award recipient Nadia Murad and her fellow 2018 Nobel Peace Prize laureate, Dr. Denis Mukwege for women who are victims of sexual violence. Murad received the Washington Oxi Day Foundation’s 2016 Oxi Courage Award and has continued her remarkable advocacy for victims of sexual slavery, with particular focus on her Iraqi Yazidi community. “As the European Union, we admire the immense courage and tireless work of Nadia Murad and Dr Denis Mukwege, who often put their own lives at risk. We have a duty to support their work and all the people they represent, as we are doing, and this is also the best way to celebrate the International Day for the Elimination of Violence against Women,” said European Commission Vice-President Federica Mogherini. The EU will be making a €1 million contribution to Nadia Murad’s “Sinjar Action Fund” initiative and a €4 million contribution to support Dr Mukwege’s work for victims of sexual violence and women suffering from gynecological conditions in the Democratic Republic of Congo (DRC). This follows the unveiling last week of a new “Murad Code,” named after Nadia Murad. 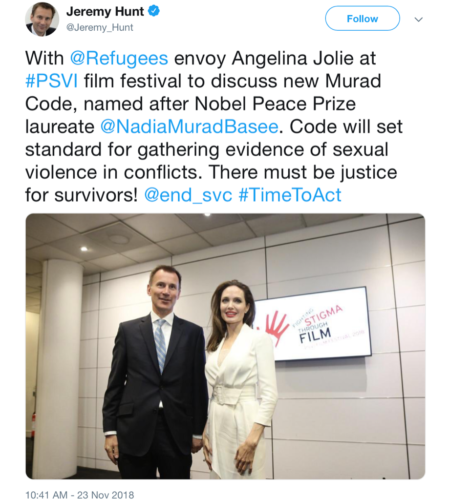 UN Special Envoy and actress Angelina Jolie and UK Special Representative for sexual violence, Jeremy Hunt, headlined a British Film Institute Festival featuring films enabling survivors of sexual violence in war zones to tell their stories. The Murad Code, announced at this festival, will set the standard for evidence-gathering for investigating sexual violence in war zones.